Linespeople play a very important role in our Association and are a key part of the match officials team. 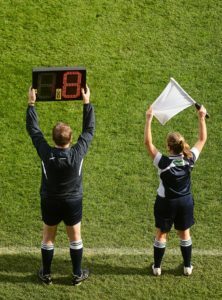 Below are a number of key areas to be aware of with regards to the role of a linesperson. 534. There shall be two linespersons, one at either side of the field. They may be appointed by the referee, County Board, Provincial or Central Council or their sub committees. To decide where the ball crosses the sideline and to which team the sideline kick is to be awarded. Point the flag in the direction in which the sideline kick is to be taken. Deal with and bring to the referees attention, any incidents which the referee may not have seen, or incursions onto the field of play by the team managers, coaches, selectors or unauthorised persons. 536. The Linespersons may change sides at half time. If no 4th official introduce yourself to both managers and tell them to let you know when they want a sub. Their sub should be ready to go on. You must be strong when dealing with side line officials and do not get involved in altercations on decisions or scores etc. We always look at performance of players, management and referee but how did you do? Did I keep up with play? Did I communicate with the line and fellow officials? Be confident not arrogant!!! How you speak and act! Do not go chasing after the ball when it is out of play. If you are at a pitch where there is nobody else you can drop the flag at the point the ball went out and then retrieve the ball. This is in exceptional circumstances. No phones, chewing gum etc.